Do you need retail store security cameras for your business? We specialize in CCTV Installation service for stores of any size. We will layout the ideal security solution for your retail establishment and then install it in a timely manner. Located in Boca Raton for over 10 years and serving all of Florida with Retail Store Security Cameras services. When choosing a top notch Security Camera Installation Company to design and install your surveillance cameras, you will have a peace of mind knowing it will be done on time and the correct way! Thoroughly satisfying our clients is ultimate priority. Retail Store Security Cameras and installation for all of your surveillance products. We have served retail establishments all throughout Florida for over10 years. Our Security Camera Installation service is affordable for shops and retail storefronts of all sizes. TechPro Security Products develops and creates the highest quality security systems. CCTV installation is our expertise for all types of surveillance and security products. We completely back all of our security products and installation services. Protection of your inventory and retail store is crucial to your businesses success. Our surveillance products and security cameras are fully supported all throughout their lifetime. Retail store security cameras will deter crime and hold those accountable for crimes against your retail establishment. TechPro Security Products offers many types of security solutions at the most affordable pricing. Retail store security cameras have the ability to be monitored remotely, onsite or by anyone who you authorize. Security notifications can be sent for any type of activity during and after hours. From motion to sound be alerted via text or email of any suspicious activities. 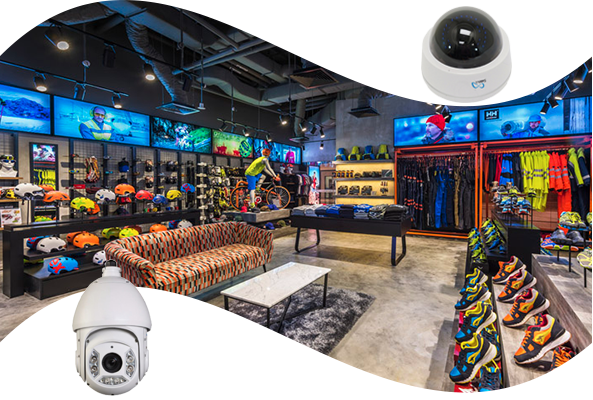 Remote Video Monitoring and access control services for any size retail storefront. Need to talk to a security camera installation expert? Find out more about Retail Store Security Cameras today! Retail Stores and businesses with any type of inventory will always find themselves exposed to criminal activity. The open nature of a business to anyone lets thieves have easier access to some of your inventory. Having the ability to view and monitor your retail security systems onsite or remotely will allow for immediate response to any criminal activities. Our retail store security cameras of the highest quality and the surveillance methods implemented are proven. Let our security camera installers configure your security system for optimal coverage. Covering the most important aspects: inventory in the front retail area and back stock rooms, entrances and exits but most importantly the cash register. When you have retail store security cameras set up correctly you can protect your business around the clock. TechPro security camera installation department has established itself for delivering the top notch security products and excellent CCTV installation services. Satisfaction for each and every client one job at a time with our security camera installation services is our main goal. Our reputation for providing retail store security cameras is unsurpassed.